A new iPhone app available on the Apple App Store gives the Gym training on the go. REPS: Mobile Trainer is the easy way to burn calories or tone muscles by using your iPhone or iPod like a free weight. Simply curl your iPhone up and down like you would a weight and watch the calories drop in real time. Using the 135 gram iPhone as a free weight, the app brings a real-time rep counter, calorie counter and weight loss targets, while music from the iDevice can be played at the same time as training. YOu can also put some motivational songs during your training. 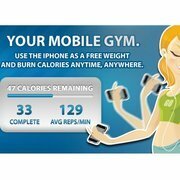 REPS: Mobile Trainer is available now for the iPhone and iPod touch for £1.79.